Outflows the factory unit by over 45%. More Induction noise and chatter. Billet Alloy CNC Machined Inlet mouth. Here at Pumaspeed, when we design Racing design a new product they design it with no compromises. This first of its kind new Pumaspeed Racing Turbo Inlet is an easy-to-install bolt-on upgrade that eliminates any possible restriction before the turbocharger. It fits all stock frame KP39 Turbos and all hybrid units such as the X-37, X47-R. Unlike the stainless steel or alloy fabricated units on the market today that incorparate a 43mm transition pipe, this newly designed CNC Mouth and Silicon Elbow offer a massive 70mm-63mm cross sectional area with zero restriction directly in front of the compressor wheel, which allows the engine and turbocharger to work more efficiently in order to achieve the most power and torque possible. This flow increase is achieved through the smooth transition of air, all the way from the 70mm Pumaspeed inlet silicon and cross over pipe through to a new silicone that smoothly transitions from 70mm to the 60mm. It then connects to the CNC inlet mouth, where it is immediately channeled into the turbocharger mouth, giving no loss or restricion of any type. Keeping this cross-sectional area as large as possible is the key to the pipe's performance gains, it greatly outflows smooth looking continuously tapering designs. When combined with the R-Sport cross over pipe, this Pumaspeed Racing Turbocharger Inlet System outflows the factory components by up to 45%. The new CNC machined turbo inlet mouth has a massive 46mm inlet connection to the turbocharger which matches the X47R precisely, so we suggest to all X47R users that this new unit be used to maximize the response and flow. When coupled with the R-Sport cross over, this unit has proven flow of over 350bhp. The unit is fully compatible with most alloy cross over pipes but will need a straight 63mm coupler to enable it to fit to the stock Ford plastic cross over. The Pumaspeed Workshop team are ready to fit the Brand New - Pumaspeed Racing Billet CNC Turbo Inlet in our Head Office located here. Therefore making parts and labour a total cost £193.00 (inc. VAT). 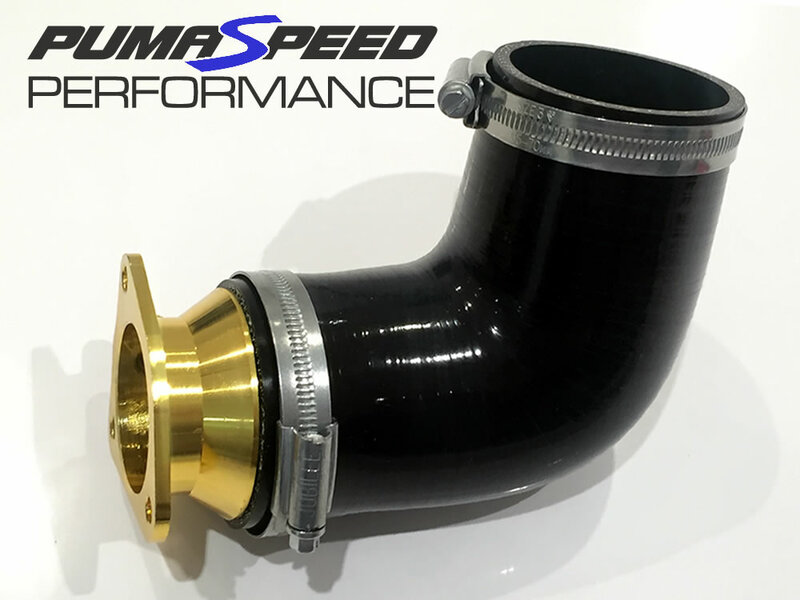 Pumaspeed have a specialist distribution team that can dispatch the Brand New - Pumaspeed Racing Billet CNC Turbo Inlet to any destination worldwide.